Agility is a members only skill which gives access to various shortcuts around, and a higher Agility level allows for faster run energy restoration. At level 1 agility, run energy recharges at approximately 1 percent per 7.5 seconds whereas at level 50 agility, the rate is 1 energy per 4 seconds. This bonus applies in F2P worlds. Higher Agility levels may also allow you to avoid the damage taken when caught pickpocketing. Agility is one of the most straightforward skills in RuneScape. However, due to the fact that it's trained through monotonous clicking, it is widely unpopular among players. It is helpful in almost all agility courses to take food in case you fail, and energy or super energy potions made using the Herblore skill. This allows you to keep running continually around the courses and gaining experience faster. For each course you normally receive an amount of experience per obstacle completed, and a bonus reward for completing the course. On many courses, the amount of damage taken after failing an obstacle is based on your remaining Hitpoints, so to conserve food it is often worthwhile having your Hitpoints fairly low. For example, falling into the lava might cause 12 points of damage in the Wilderness course when you have full Hitpoints, but only cause 6 if you have 20 Hitpoints left. The training courses are identified with a running figure icon on the map. As it has no requirements, it is recommended that new Agility trainers begin here. 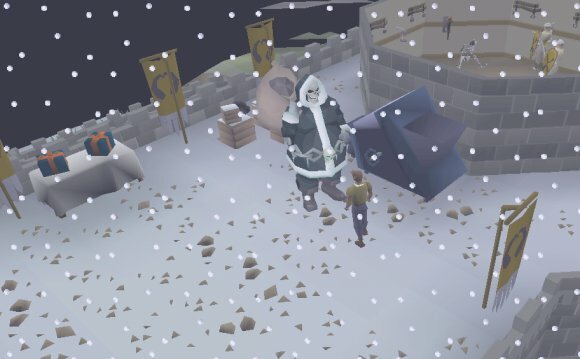 It is located near the Grand Tree in the Tree Gnome Stronghold, northwest of Ardougne. It is impossible to fail any of the obstacles at this course so no food is required, though some energy potions may be helpful for faster training. The Brimhaven agility arena is different from other agility training spots. In the arena players have to tag pillars separated by agility obstacles. Every time players enter the arena, they must tag the pillar with the flashing arrow above it, and upon every consecutive time they manage to tag the right pillar, they will receive a ticket, which is redeemable by Pirate Jackie the Fruit for various rewards, including Agility experience.